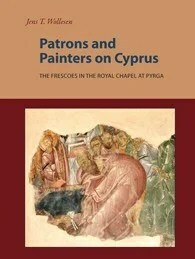 The fresco decoration of the Royal Chapel in Pyrga on Cyprus is usually dated 1421. The coat of arms featuring the Cross of Jerusalem and the lion rampant points to royal French commissioners, namely members of the Lusignan dynasty. Western, French patronage left its imprint on this chapel in terms of architecture and pictorial decoration – although within a complex Cypriot frame. The study presents iconographical and stylistic evidence supporting a much earlier dating into the first half or the middle of the fourteenth century. The choice of scenes (with French tituli) has no comprehensive model on Cyprus. Significant western additions and variations distinguish this Lusignan program from other indigenous Cypriot predecessors and contemporaries. The iconographical analysis shows that the workshop made use of earlier Palaiologan Constantinopolitan models, such as the Kariye Camii mosaics. The iconography and the emotional pathos of some scenes suggest an awareness of western, French source material, and in particular of Franciscan book illuminations, Psalters, Missals, and Books of Hours. If this revised dating is correct, the program of decoration is an outstanding testament to royal, specifically Lusignan, commission and represents the first and most faithful adoption and adaptation of Palaiologan models in Cyprus. Click here to see the Facebook page: Marry me, Jens T. Wollesen!